A wine country getaway to Sonoma County and Healdsburg would not be complete without a stop at the funky Jimtown Store in the Alexander Valley on Highway 128. It is one of the most popular places for stocking up a deli lunch and picnic supplies. Carrie Brown and her late husband John Werner purchased the historic Jimtown Store many years ago and turned it into a landmark destination. Whenever we are in Healdsburg, we always make a stop at the Jimtown Store for our picnic lunch. We enjoy perusing the store and never mind waiting while the staff prepares our order. One of our greatest life pleasures is to picnic and sip wine among the vineyards. 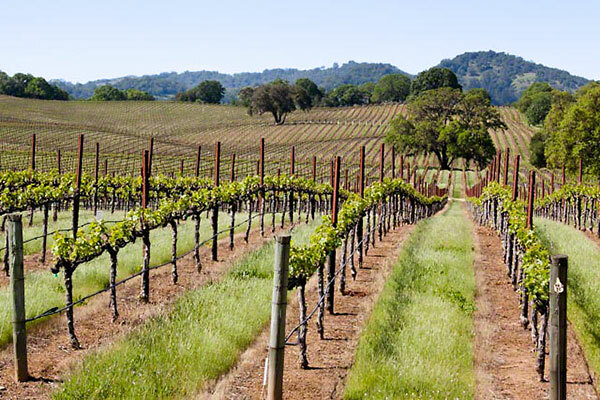 The Alexander Valley is one of the most beautiful settings in any wine country in any part of the world. Traveling along Highway 128 are many options for wine tasting and picnicking. Most of the wineries along this route have picnic facilities. The tasting rooms, for the most part, are low key, casual, and fun. To get to the JImtown Store from Healdsburg head north on Healdsburg Avenue and make a right turn onto Highway 128. Within a few miles, you will come to the Jimtown Store. Here is a link to the Carrie Brown’s Jimtown Cookbook featuring the delightful concoctions available at the Jimtown Store. April in wine country is when tasting room activity ramps ups. Lodging, restaurants and wineries prepare for the return of tourism to wine country. This year, an unusually warm winter has caused an early bud break in the vineyards. The vines are three weeks ahead of the normal growing season. This photo was taken near Field Stone Winery on Alexander Valley Road, near the Sonoma County town of Healdsburg. 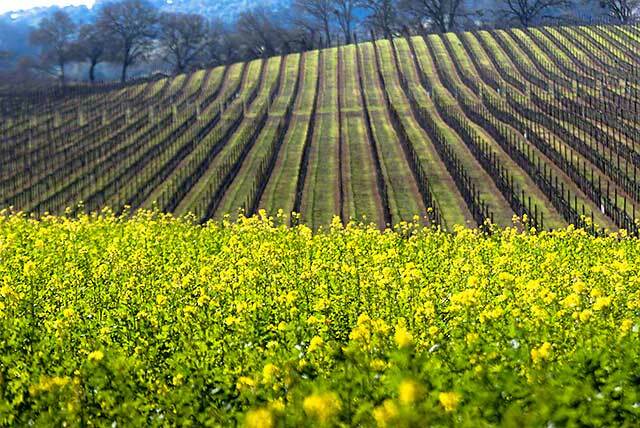 April is one of our favorite times in wine country. The vineyard rows look clean and neat. Wild flowers, especially the California Poppy, are abundant. The climate in April is cool and pleasant for walking and picnicking in the vineyards. A favorite winery of ours to visit and have a picnic lunch is Field Stone Winery. It is quiet here, even on weekends. The views are fantastic and no one seems to care if you stroll around the vineyards. The picnic tables are all under very old oak trees. The tasting room staff is very welcoming at this family-owned winery. To get to Field Stone Winery, take Healdsburg Avenue to Alexander Valley Road (Hwy. 128) and follow it for ten miles until you get to Field Stone. 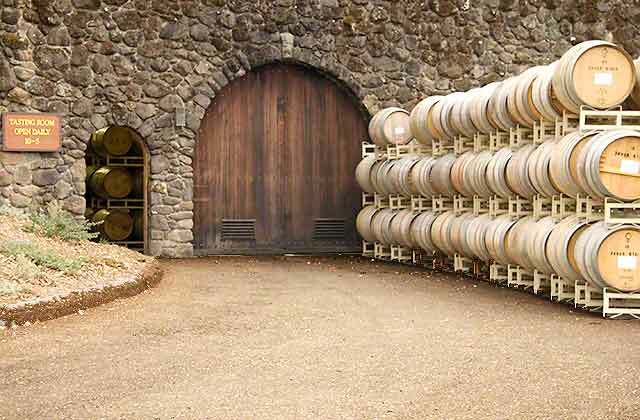 Another winery to visit is Hanna Winery just before Field Stone. The tasting room is high on a hill and the views of the Alexander Valley are spectacular. For complete details on Field Stone, Hanna and other nearby wineries consult our Alexander Valley Wine Trail. beauties of winter in wine country. The mustard plant is in full bloom. Beyond the mustard are recently pruned vines. This is pruning time in wine country. From now to mid March, vineyard managers will prune the vines in preparation for the next growing season. This officially begins when the plant comes alive and starts to grow buds. Bud break occurs in April. At the higher elevations, pruning is delayed as long as possible. Pruning stimulates bud break and, if bud break is too early, frost may still be a possibility. Higher elevations experience a greater risk of frost; thus, delaying bud break is a good strategy. What a beautiful setting, especially when the Fall colors show in the vineyards, for the Stryker Sonoma Winery in the Alexander Valley of Sonoma County. The tasting room is spacious with full window views of the vineyards on three sides of the tasting room. The picnic area is ideal for a secluded picnic and a glass of one of the many tasty wines poured by the Stryker winery. The winery started in 2002 with Tim Hardin the winemaker, who still indeed produces some delicious wines. The winery makes between 4000 to 6000 cases a year. Visiting hours are 10:30am to 5 pm daily. To get to Stryker Sonoma, take the Dry Creek Exit off Highway 101 to the east. Turn left on Healdsburg Ave. In a couple of miles pick up Highway 128 on the right. It will take you over the beautiful Russian River. When you get to the stop sign, take a left and head north about a mile or two to Stryker-Sonoma winery. At that stop sign on the corner, we suggest you also stop in at the Medlock Ames tasting room. It is a very cool tasting room complete with a large vegetable garden. It just started out as Wilson Winery on Dry Creek Road in Sonoma County. For years Diane and Ken Wilson toiled at the winery, quietly making a name for their Zinfandel wines. Then opportunity came knocking and in just a few years the Wilsons owned an additional five wineries: Matrix, Mazzocco, deLorimier, Jaxon Keys, and Soda Rock. The latest in this fast-paced acquisition is the Soda Rock Winery in the Alexander Valley on Highway 128. For years we’d driven past Soda Rock Winery in bewilderment. A sign pointed to the entrance to Soda Rock but a quick glance of the area showed no signs of life. The area was dismal and shabby and appeared to be totally abandoned. But apparently someone was making wine in there, Charlie Tomka in fact. At some point within the last couple of years, Charlie Tomka sold the building and the name of the winery to the Wilsons. The vineyards had long been sold off, so no vineyards were part of the deal.